Jason Falla: Redback One on Zeroing and Accuracy. Redback One on Zeroing and Accuracy. To adjust elevation using the factory M4 iron sights, rotate the front sight using a sight adjustment tool, multi tool or the tip of a bullet. To bring the point of impact up, follow the arrow markings on the front sight base. Up will be clock-wise and down counter clock-wise. Each indent or click on the front sight will move the Point Of Impact or (POI) by 1-inch at 100-meters. To adjust windage using the factory rear A2 sight, follow the arrow markings on the right side of the windage knob. To move the POI to the right, turn the knob clockwise. To move the POI to the left rotate the knob counter clock-wise. Each click of the windage knob will move the POI ½ an inch at 100-meters. The pattern formed after firing is known as the group. The center of the group is known as the Mean Point of Impact or (MPI). In order establish a group, the shooter must fire a number of rounds consecutively without changing positions. Typically 3 rounds are used during the initial stages of the zero. By firing only three rounds, shooters can conserve ammunition while making bold adjustments to windage and elevation. Once the group has been moved to the desired location, the shooter should fire a five-round group to confirm that the zero is correct at that range. Firing five rounds will highlight consistency in marksmanship and will also expose any inconsistencies with fundamentals during the firing process. For example, if you only fired three rounds and one round was separated from the other two, it could be assessed that the separated round was a flyer, an error created due to poor fundamentals. However, if another two rounds were fired and were grouped together with the single round (flyer), the group would then read as if the two initial good rounds were the inconsistent ones. This is known as a split group and the firer should fire again. Split groups are difficult to assess and an indicator that the firer moved the firing position in between shots or adjusted position midway through the group. Following the manufacturers guide will give the shooter the best results when making adjustments to the sight during the zeroing process. The shooter must determine the center of the group or, the Mean Point of Impact or (MPI) before making any adjustments to the sight. If after firing the first three round group it is determined that the MPI is a long way from the desired zero point, the shooter should make bold adjustments, using the manufacturers guide to move the group in the general direction of the zero point. Once the shooter is in the vicinity of the zero point, he can then use fewer click adjustments to make fine movements of the group until the correct zero is achieved. Remember, the value of the click will be reduced by three quarters when zeroing from 25-meters. Therefore, if the value of each click is 1-inch of movement at 100-meters, the value of the same click will be ¾ less or ¼ of an inch at 25-meters. 50m-200m Zero. To achieve a 50/200-meter zero, the MPI of the shot group will be 1” low of the aiming mark at 25-meter. When using the Redback One Zero target the shooter will use the solid 1” square of the lower left or right zeroing target as the Point Of Aim or (POA) reference at 25-meters. The POI should be center of the hollow 1” square directly below. The group is measured from the center of the furthest apart shots in the group. The distance between these shots is known as the extreme spread or (ES). The ES at 25-meters should no more than 1.5-inches. This represents the minimum marksmanship requirements at 25-meters. 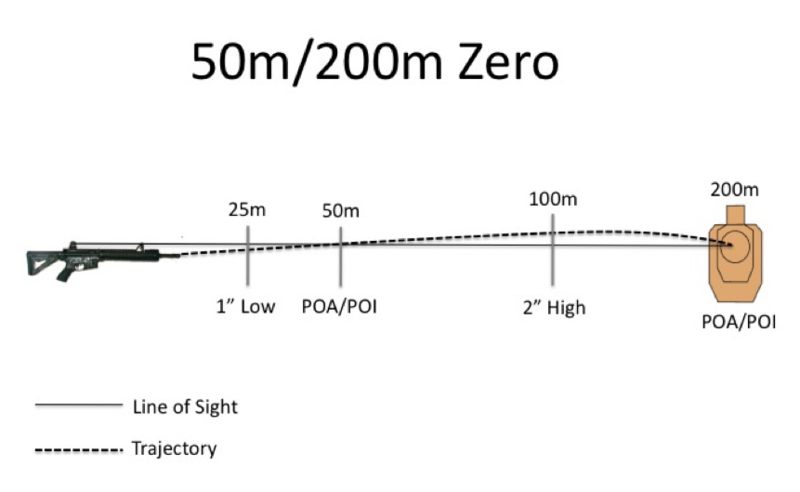 When zeroing is performed at a reduced distance, it is important to confirm the zero at each zero distance. The first distance will be at 50-meters. When using the Redback One Zero target, shooters will use the lower bullseye target to confirm at this range. Groups should be Point Of Aim / Point Of Impact at this distance. Minor adjustments may be required for some shooters. The ES at this distance should be no more than 3-inches. After the group has been assessed, the shooter should then move to the 100-meter line and fire (3) deliberate (10) round groups for marksmanship purposes, breaking and resetting the firing position between each group. This will establish a Central Zero Point (CZP), or true zero of the weapon. The CZP should be approximately 2” above the POA at 100m. The ES at this distance should be no greater than 6-inches. This represents the minimum marksmanship standards at this range. 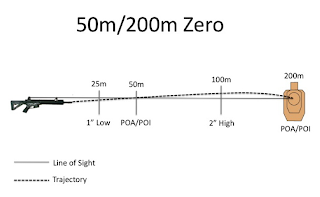 The following picture highlights the trajectory of the bullet and where it intersects the line of sight at 50m and 200m. This picture is not to scale and should be used as a guide only. The shooter must move to the 200-meter line and confirm the zero is correct and can accurately engage targets at that range. An automated range with monitor to reference shot placement is preferred. However, is this is not available; using a butts-party to identify impacts can be used. As an alternate method, several steel reactive targets can be placed at the berm. The shooter can engage the steel targets to receive instant feedback of hits. This method is relatively crude, as it will not allow the shooter to determine exact accuracy. Using a paper target with a contrasting aiming mark will allow the shooter to fire an accurate group and move down the range to check zero. Accuracy is based upon three key factors. When selecting a weapon, the purchaser should take the following into consideration. 1. Reliability. The weapon selected should meet or exceed military specifications of reliability. There are many articles posted on this subject on the Internet and end-users should research reliability reports prior to purchasing their weapon. I choose to use all Mil-Spec parts and accessories for my weapons and ideally, a complete weapon system manufactured by a reputable military grade company. 2. Accuracy. This seems to be a contentious issue these days as there is a lot of speculation as to the quality and durability of parts and accessories being offered on the market by the vast amount of ‘black rifle’ manufacturers. Again, I suggest doing some research on manufacturers to ensure that you are buying exactly what you thought you were. Accuracy is typically associated with the upper receiver. To that end, the barrel and the fit to the upper receiver. A matched bolt can improve accuracy slightly as lock up is more consistent. The industry standard should be 2 MOA when it comes to the weapon systems accuracy. Don’t get sucked into Mil-Spec either. What I mean by that is that the military will always select a weapon system based on reliability before accuracy. If you are looking for a super accurate 1 MOA gas gun, maybe a custom manufacturer might be worth looking into or a very specific military weapons system dedicated to performing to that accuracy standard. The second factor in accuracy is the type of ammunition that the firer has selected to use. Mil-Spec, Match, commercial are three basic terms that can describe categories in general. Mil-Spec ammo is mass-produced to military specifications and again is designed around reliability over accuracy. Bottom line with Mil-Spec ammo is that it is capable of holding a 2 MOA group at 100 meters. This may not win you a gold trophy at the three-gun competition though. Match ammunition is designed for competition and is spec’ed with accuracy as the primary focus. The projectile is not seated as deep or tight as Mil-Spec ammo so that it leaves the case more consistently when fired. Most match rounds also have a hollow point to assist with accuracy. Hollow point ammunition has been a contentious issue in the military and how or if it violates treaties signed by the U.S Government. Commercial grade ammunition like many rifle manufacturers, produce a range of ammunition that is designed for the average user. Some make ‘close to Mil-Spec’ rounds others hoping to bid on military contracts will make to Mil-Spec standards. At the end of the day, there are some good commercial manufacturers of ammunition that is suitable for training and defensive purposes. I use a combination of commercial loads and Military loads with my weapons for training. When selecting your ammunition, you should look for a round that is reliable and can produce accuracy standards of 2 MOA at 100 meters. There is some much to learn about ammunition and ballistics but these very basic points will help in making better choices. Don’t get sucked into industry hype about guns, ammo, shooting and accuracy. Unfortunately the industry is full of companies trying to sell you things you don’t need. Some are trying to manufacture solutions to problems that don’t even exist! And, outside of product manufacturers there are the firearms experts who know everything and can teach you everything you need to know. Well, just like buying a weapon, make sure you do your research when it comes to selecting a service provider to train and teach you how to deploy your weapons. In an over-saturated market, few will prevail. The cream typically rises to the top and those that lean forward and continue to progress and develop new innovative methods will be here when the smoke clears.